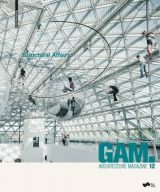 GAM – the Graz Architecture Magazine was a partner of the Eurozine network from February 2011 to November 2015. The architecture faculty of Graz University of Technology, Austria, publishes a book-like magazine in which important topics from the areas of architecture, urbanism and landscape are addressed. GAM – the Graz Architecture Magazine is an independent medium that publishes contributions to the current architectural discourse at a consistently high standard in both English and German. Each issue is dedicated to a particular theme. By focusing on distinct viewpoints and approaches to these themes, and by selecting contributions by an open peer-reviewed process, GAM is conceived as an engaging forum in which different and possibly controversial views are expressed. GAM also presents a section on “faculty news” featuring current developments and events, publications and outstanding achievements by the architecture faculty and students at Graz University of Technology. It is the official publication of the faculty of architecture at Graz University of Technology and its editors are members of the faculty of architecture. GAM is available in bookstores worldwide or distributed online through Springer Verlag Vienna/New York.